Arithmancy is divination (i.e., prediction) by the analysis of names and their numerical equivalents according to a chart which attributes a numerical value to each letter of the alphabet. The Chaldeans (ancient Babylonians) used the chart on the left which does not include the number nine. 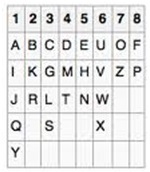 The Greeks used a similar chart which incorporated three rows of letters and included the number nine. A single-figure score was calculated using vowels to establish a heart number or consonants to work out a social number. The practice is supposed to evaluate a person's strengths and weaknesses and, somehow, to ascertain future events that might befall them.